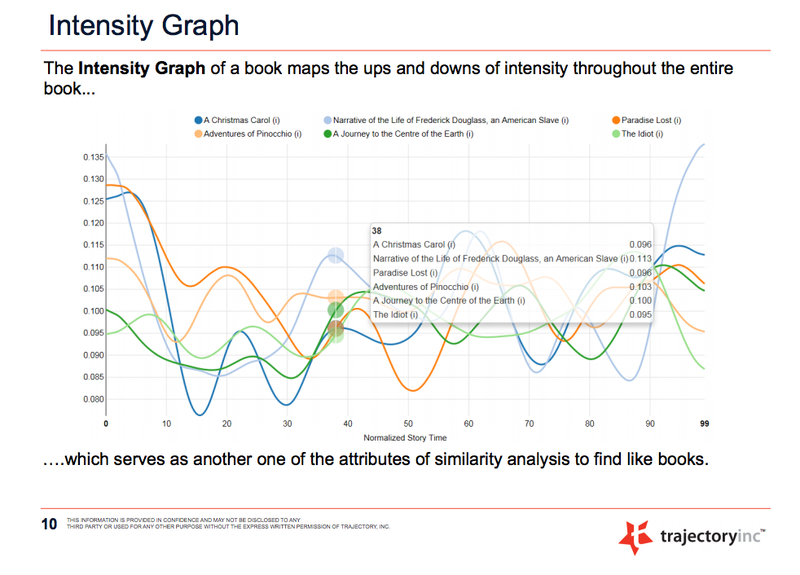 Using advanced language processing, Trajectory adds nuanced detail to book metadata and offers analytics for intensity and sentiment, among other qualities. 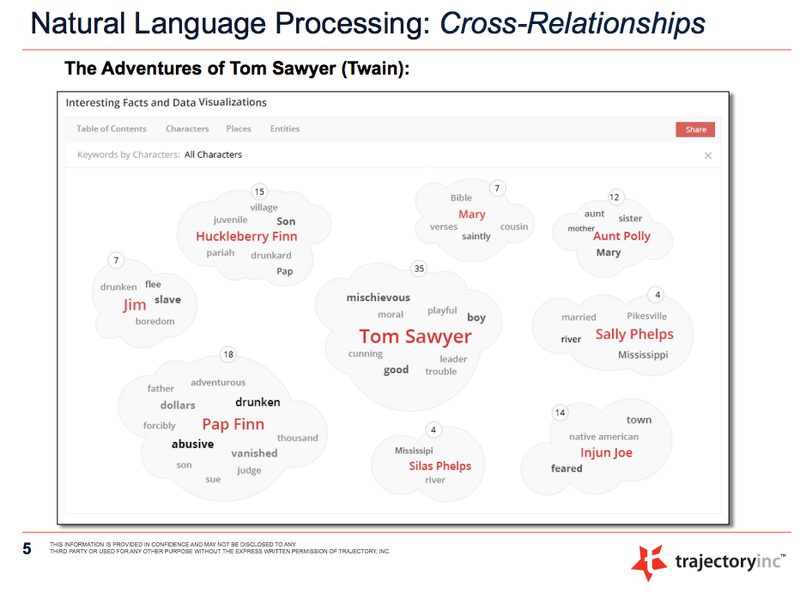 “We deconstruct every sentence in a book, analyzing the core entities — the specific use of language in a variety of different ways, the parts of speech — to form the basis of what is really going on in the story,” says Scott Beatty, Chief Content Officer for Trajectory, a firm based in Marblehead, Massachusetts, north of Boston. That said, Trajectory is currently focused on title indexing. Its catalog of indexed titles comprises some 30,000 English language books, including many from HarperCollins; but Trajectory’s biggest client base is in China, where the company is working with Joy Jung, Ennui, and People’s Education Press (which has published some 60 billion books in 60 years), to index 100,000 titles. Founded just two-and-a-half years ago, Trajectory has largely been absent from the media, save for the period 15 months ago when the company acquired the assets of now defunct book discovery site SmallDemons. “But we only acquired their contracts with publishers, not the technology — we were far head of them on the technology side,” notes Beatty. 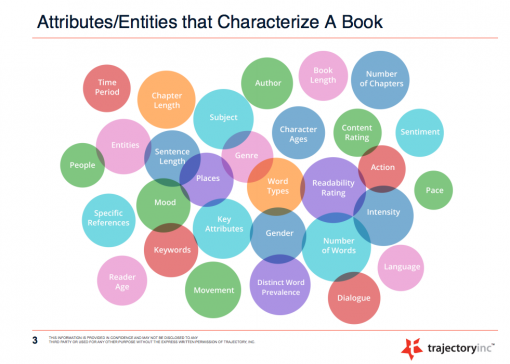 For starters, “we break the book apart,” say’s Beatty, “generating lists of keywords in every story. 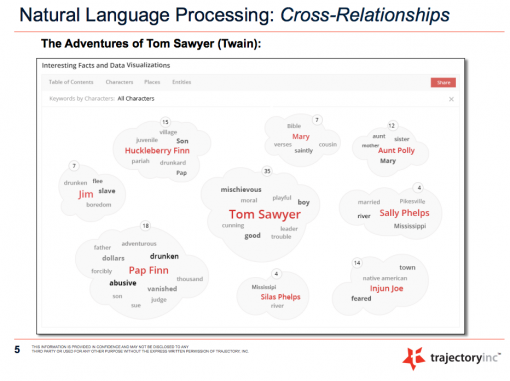 We analyze such things as co-occurrence — the words that surround a character or location — and from this [we] can plot it and show you where people occur on a graph. We can also sort this on relevance. You can monitor character interactions in a way that allows you to understand a story in a certain way, you can do this with other entities that occur in a book. 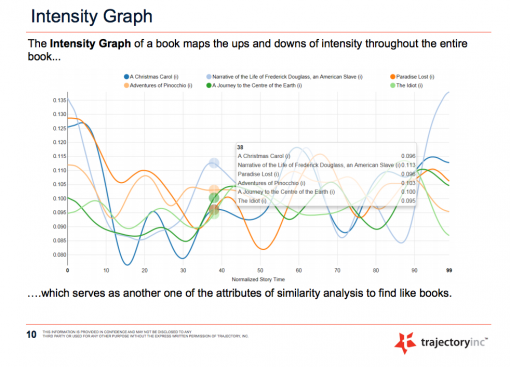 Trajectory can also track such things like sentiment in a novel. 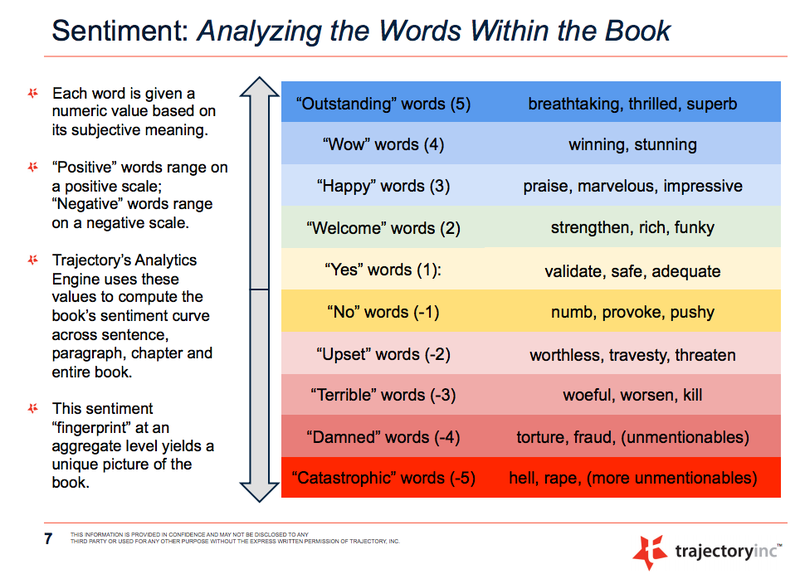 To do this, it employs a rating system for certain positive words, something that indicates excitement, for example, and negative words, such references to war or death. It was just a short time ago that “discoverability” was the buzz word of the industry. And that was when the average library or retailer had only a few hundred thousand titles; today that number typically exceeds one million. What’s more, when you add in self-published titles, that number is multiplied several times. “Self-publishing is the greatest challenge to book discoverability online,” says Beatty. “The finest work product we have right now is largely targeted at retailers and libraries,” he notes. “We can work with them and — through keywords that indicate sentiment, intensity and use of language, among other factors — are able to make book recommendations based on a wide variety of vectors. Its lists of keywords are currently available in English and Chinese, though it is currently translating these into Spanish, German and Portuguese. Clients are provided the data via ONYX feeds and metadata. Some may remember Booklamp, the Idaho-based company that had similar ambitions with its slice-and-dice approach to books, producing vast reams of metadata. That company was acquired by none other than Apple. 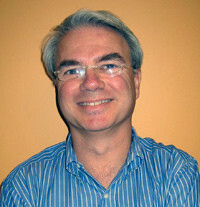 “We think that Apple, in their purchase, validated the concept. That said, we have had clients tell us that ‘While Booklamp was a fireworks display, Trajectory is like a Saturn 5 rocket’” — presumably taking you places in a book you’ve never been to before.